Aimee Barrett-Theron, South Africa’s leading female referee, will hold the whistle in the opening match of the Women’s Six Nations for the second year in a row when she takes charge of the encounter between Ireland and England in Dublin on Friday. Barrett-Theron broke onto the international scene in 2017 when she was named on the World Rugby Women’s Sevens Series referee panel, and she has not looked back, with her subsequent appointments including the Rio Olympic Games, World Rugby’s Women’s November Internationals and the Women’s Six Nations. 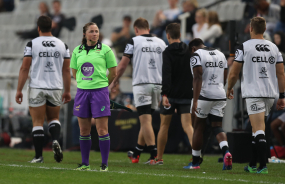 Her other career highlights include becoming the first female to be named on SA Rugby’s Premier Panel, to referee a Currie Cup First Division match and an U18 Craven Week match. Barrett-Theron also had the honour of officiating the first Test in the Women’s Six Nations last year between Scotland and Ireland. Her second assignment in the Women’s Six Nations will be on Saturday, 9 February, between Italy and Wales at Stadio Via del Mar in Lecce. “We are very proud of Aimee,” said SA Rugby CEO Jurie Roux.